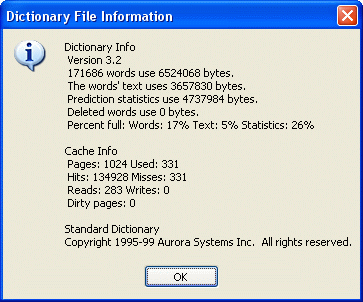 The Dictionary Info dialog displays information about the current dictionary and cache usage. This section provides details about the contents and usage of your dictionary file. The most important information is the number of words, the amount of space used by deleted words, and the percent full. These give you a quick indicator of how your dictionary is doing. If the Percent Full numbers get near 100, you should consider using the dictionary optimizer and removing some older and unused words. The space used by deleted words will also be recovered during optimization. This section provides details about the size and usage of your dictionary cache. Used tells you how many 4K cache pages are in use. Pages tells how many you have allowed on the Dictionary Tab. Generally if Pages equals Used and you have less than a 10:1 ratio in the hits:misses numbers you should consider making the cache larger to get better performance. The copyright and description entered when the dictionary was created are displayed at the bottom of this dialog.